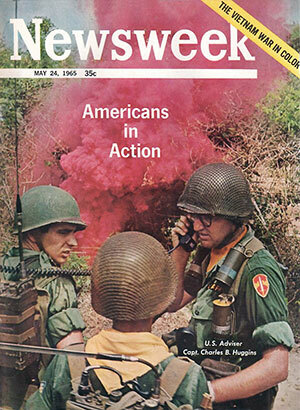 American Journalistic licence in the Vietnam War…. For anyone interested in reportage then James Fenton’s classic ‘All the Wrong Places’ is a must read book. His account of travelling through Vietnam, Cambodia and Laos during the Vietnam War is a remarkable one. As one would expect from Fenton it is a concise, honest and revealing insight into what was the most heavily reported war in history. Journalists and photographers flooded into Vietnam from all corners of the globe, hotels in Saigon became legendary for their heavy drinking reporters who met to share information, take stock or simply forget the mess that American forces found themselves embroiled in. For many of the reporters it was a case of simply staying put, not for everyone the rush to the frontline. Saigon was, until its infamous collapse, a safe base and journalists had begun to realise that if they didn’t get an inside scoop then their editors back home would soon make one. Fenton describes how American Newsweek magazine had described in one article how the Khmer Rouge were ‘prowling through the humid jungles around Phnom Penh’. Sounds dangerous, until, as Fenton points out, there are no jungles around Phnom Penh! Fenton discovered that both Newsweek and Time magazines employed researchers and rewriters who sat in offices in the US and ‘made good’ those stories which failed to sufficiently impress. He tells of the embarrassment felt by journalists in Vietnam who discovered how badly their pieces had been altered much to the hilarity of other seasoned journo’s who knew perfectly well how these things worked. More often than not it would seem, in-the-field reporters where busy answering long sets of questions sent over to help their colleagues back home write the most compelling narratives. Fenton writes of how one was asked if the poorest in Vietnam sheltered under lean-tos made of straw. Anyone with any experience of South East Asia would know that during the hot season nobody, let alone the locals, would think of huddling together to create more heat. So I write this in the interests of fairness, I have often wrote about the increasingly poor standards in journalism and the general lack of trust in what we read but it is nothing new. I suppose the onus has always been on the ‘scoop’ and the pressure to increase sales but where does one draw the line? Ultimately, the more cerebral the writing the less exposure it gets, many Americans had little appetite for the truth behind what their troops where doing under orders and we know this from the difficulties many photographers had in getting their images published. So has anything really changed? Successful publications give their readership what they want and few were more successful than Time and Newsweek. That’s fine until we remember the human cost involved in that ridiculous war. The tens of thousands of people killed, maimed for life or deprived of their loved ones, homes and livelihoods deserved better. Last week the news wires reported on ISIS killing many innocent people in a café in Iraq but the headline was in the fact that many where part of a club which supported a famous football team, Real Madrid. That was the story, not the deaths, the football connection and how Ronaldo et al will wear a black armband in respect. We really must stop this, demand better for those who have suffered and pressure the media outlets into selling us the facts. Fenton’s book is an engrossing read and does much to uncover the madness of that time and that place, it should be read by everyone in the business of news reporting and studied by aspiring writers of non-fiction. It deserves a much, much wider audience.